The Instant Pot is a perennial fan favorite and Amazon Prime Day sellout. 300,000 units were reportedly sold this year, selling out in 19 hours, which included a four-hour technical glitch. It’s no wonder. The compact appliance is a jack-of-all trades! With the push of a button, it sautés, steams, slow cooks, pressure cooks, bakes cakes, boils eggs and makes yogurt, among other functions. But what families and busy people love about the Instant Pot is that it can get meals on the table STAT! If you need Instant Pot inspiration, here are nine summery, healthy dishes that save time and don’t skimp on flavor. Cauliflower is the secret ingredient that keeps this Mac and Cheese on the lighter side. After it’s pureed, cauliflower is stirred into the cheese to give it the familiar creaminess without the heaviness. Thanks to this genius hack, this version has just two cups of cheese versus the six cups that I’ve seen in a classic recipe. Plus, cauliflower brings fiber and disease-fighting compounds while boosting your veggie intake — all big wins in my book. This Instant Pot Mac and Cheese uses gluten free pasta, but I bet you could find Instant Pot cooking instructions for whole wheat pasta or a bean-based variety if you’d like. To punch up the protein in this dish, you could stir in thawed, frozen peas or shelled edamame. Either way, I’d suggest serving it with a mixed salad because, well, more veggies! Millet is a gluten-free whole grain that doesn’t get enough attention! It’s especially rich in magnesium, a mineral that’s involved in proper heart, nerve and muscle functioning, and that helps regulate blood glucose and blood pressure. Population surveys show that most Americans get insufficient magnesium levels because we don’t eat enough whole foods, like millet and other whole grains, as well as nuts and beans, that are good sources. Though you can cook millet just fine on a stovetop, using the Instant Pot cuts the cooking time in half—down to ten minutes. Once cooked, it’s tossed with a simple dressing, tomatoes and olives. Since this recipe is vegan, Katz adds seasoned, pressed tofu as a stand in for feta. If you aren’t vegan, or you have a soy allergy or insensitivity, you could always skip this. For those who eat dairy, ordinary feta would be delicious in this dish, and if you’re skipping the tofu and want to boost the protein, rinsed and drained canned chickpeas would be a convenient option to compliment the flavors. After some staple ingredients spend time in the Instant Pot, you’ll get deliciously glazed chicken that’s weeknight-friendly, but guest-worthy. Registered dietitian and blogger Anne Mauney pairs hers with green beans and rice, but just about any veggie at your local farmer’s market will work. If you’re tired of chicken breasts, you’ll appreciate that the recipe calls for a mix of breasts and thighs (though I bet you could choose either/or). Thigh meat is considered richer and more flavorful than the breast, which many people prefer. And while it has slightly more saturated fat than the breast, once you remove the skin (as this recipe does) it’s still a lean choice. This might become your new go-to for those times you want a meatless, protein-packed, one-pot meal made from pantry ingredients that preps in just 10 minutes. Black beans and quinoa provide the plant protein, and they also happen to pack in lots of fiber. Though this is technically a complete meal, I might balance it out even more by serving it over a bed of chopped romaine. You’re definitely going to want to load up on peaches to make this fresh jam that has just four ingredients and takes a mere five minutes to prep. If you know how to cut a peach, you can make this jam! You don’t even need to peel the peaches. Deliciousness aside, peaches are a source of carotenoids (like many other yellow, orange, red and pink fruits and veggies). These compounds have been shown to protect your skin from the sun’s damaging UV rays, as well as impart a healthy glow without promoting signs of aging. I think this peach jam would elevate any cheese plate, and it would also be the perfect partner for a crusty slice of whole grain or sourdough bread. This recipe stood out to me because it’s a no-sugar-added vanilla yogurt, which is something I haven’t seen in stores. That’s worth plugging in your Instant Pot for! Most flavored yogurts contain added sweeteners, even if it’s just a “hint” (as some manufacturers say). Added sugars may promote weight gain, raise the risk of diabetes and heart disease, and potentially worsen acne. Up to 75 percent of packaged foods, including yogurt, cereal and bread, contain added sugars, which is why this no-fuss DIY vanilla yogurt makes a ton of sense. If you can’t stomach unsweetened yogurt, try adding a spoonful or two of the Instant Pot Peach Jam. Though it contains honey, much of the sweetness comes from the fruit. She had me at “no knead.” I always appreciate recipe shortcuts so this no knead bread stood out to me. Proofing the dough in the Instant Pot is another time-saving hack. While you can find a good packaged bread, nothing tastes as delicious as freshly baked. Use it as a base for nut butters, avocado mash, your homemade peach jam or simply to serve up your favorite sandwich fillings. Spaghetti squash is in constant rotation at my house and this Instant Pot recipe speeds up the cook time, which most of us can appreciate. Once done, it’s tossed with basil and tomatoes for a light, summery and flavorful meal. Spaghetti squash is a great alternative to pasta when you’re looking to eat lean; it has just 42 calories and 10 grams of carbohydrate per cup. The same amount of spaghetti has about 200 calories and 38 grams of carbs. And let’s face it: Who eats just one cup? Since this recipe has your veggies covered, you may want to add a protein topper. Grilled shrimp would pair well with these flavors, either tossed together with the spaghetti squash or on the side. 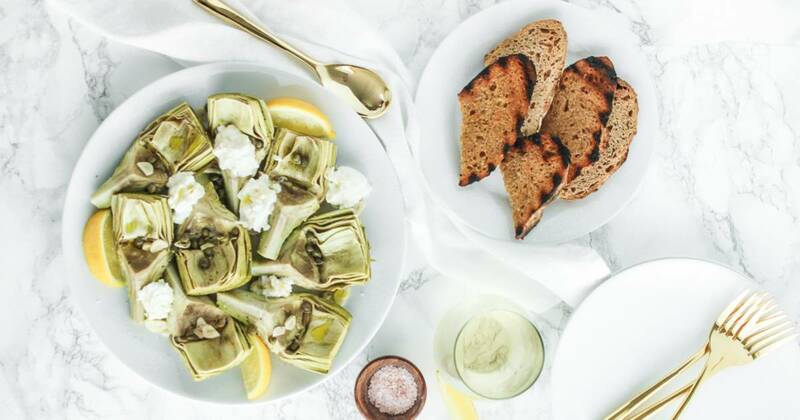 Artichokes are light in calories and carbs but high fiber, packing 7 grams of this hunger-fighting nutrient in each globe. Notably, artichokes are high in fructans, a prebiotic fiber that provides fuel for beneficial gut bacteria. Research suggests that a high fiber diet rich in a variety of prebiotic fiber can lower markers of inflammation, boost your immune system and lower the risk of allergies and inflammatory conditions. Most of the artichokes we eat come from California, so while spring is peak season, you can enjoy them year-round. Get your hands on one for this delightful dish, which pairs the veggie globes with a wine-lemon sauce, salty capers and creamy burrata cheese. Enjoy it as a side dish or atop your favorite pasta. October 13, 2018 Comments Off on ‘Middle-class’ Joe Biden hits the trail for Dems, but will it win back working-class voters?